The Tartan Army Sunshine Appeal have an exciting new product on offer. 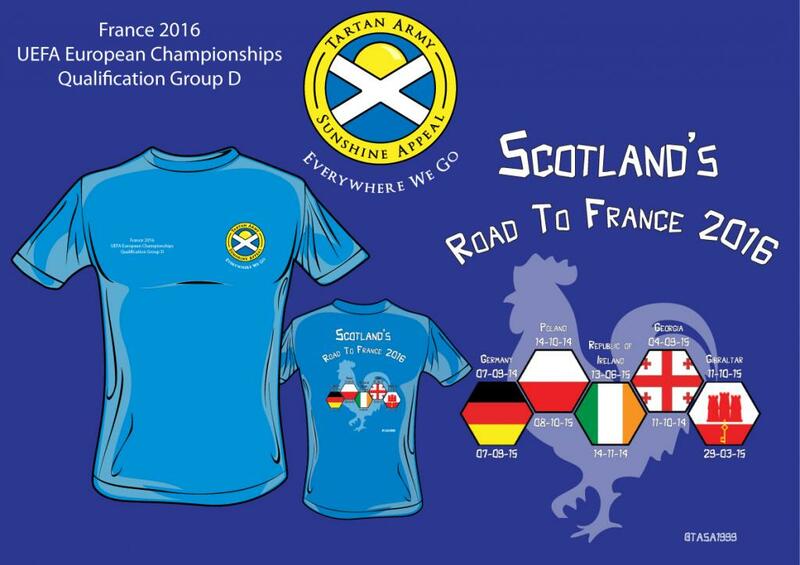 Specially created for the Sunshine Appeal, these T-shirts and polos will remain current and relevant all the way through the upcoming Euro 2016 Qualifying Campaign. The garments carry the national flags of all our opponents and the dates upon which the matches will be played. These T-shirts and polos can only be purchased at our two supporting pubs. The Iron Horse on West Nile Street in Glasgow. The Radical Road Bar and Restaurant on Willowbrae Road in Edinburgh. With thanks to Jennifer and Martin for helping us supply these to the Hoi-Polloi.